Find pieces of Fitzgerald's New York—as well as a few tie-ins to Baz Luhrmann's film—at these spots. 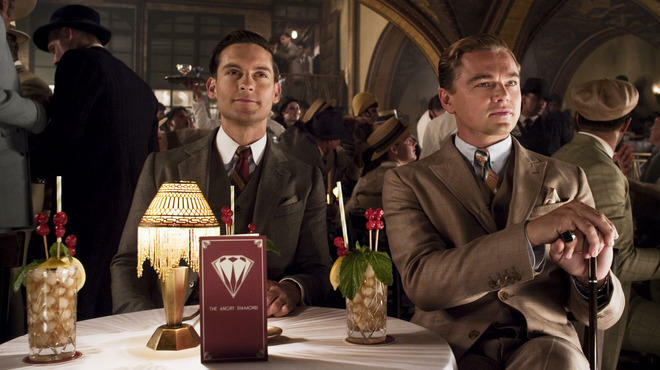 Baz Luhrmann’s adaptation of The Great Gatsby is out tomorrow, and alas, the reviews have been less than enthusiastic. But we’ve still got F. Scott’s Fitzgerald’s era-defining novel on the brain, as evinced by our cover story this week, devoted to New York City’s retro scene across multiple decades. But if you’re looking to specifically channel the Roaring ’20s—and The Great Gatsby in particular—check out these NYC spots. NYC has no shortage of speakeasy-inspired spots for sampling classic cocktails, but this Art Deco lounge, located on the Empire State Building’s ground floor, takes things a step further, featuring drinks created with the novel’s characters in mind. Try the Gatsby’s Bootleg Punch ($13), which combines gin—not of the bathtub variety—with lime and grapefruit juices, simple syrup and unsweetened iced tea. Available through May 10. The fancy-pants couturier teamed up with costume designer Catherine Martin (who also happens to be Baz Luhrmann’s wife) to create the glitzy gowns and accessories for the film; now you can see those costumes, as well as behind-the-scenes video, at “Catherine Martin and Miuccia Prada Dress Gatsby,” an exhibit at Prada's Soho store. The show also features a gigantic mural decorated with a composite of scenes that take place in Jay Gatsby’s lavish abode. Through May 12. Farther uptown, costume designer Martin also has her hands in a window display at Tiffany & Co.: To coincide with the launch of a special Gatsby-inspired jewelry line, on which Martin collaborated with Tiffany, the ritzy shop has decorated its windows with a Jazz Age theme. And if you’ve got $200,000 to spare, you too could wear a diamond-encrusted headpiece, just like the one Carey Mulligan sports in the film. Chumley’s, one of Fitzgerald’s favored haunts, is currently closed (though a New York Times article from December intimated that the storied bar may reopen at some point). But if you want to drink where Scott drank, head to Minetta Tavern; though it’s not quite the same as it was when the author hung out there (along with contemporaries like Ernest Hemingway), you can soak in the old-timey ambience—assuming, of course, you can get a table.